14-Mar-2014 -- This is the first out of 2 reports reaching confluence points in Southern France. Cycling and confluencing is my favourite combination of travel. To make it to a (to me new) confluence point and back to Zurich within a weekend, I need to approach the area by train and start cycling from a train station. Slow trains do take bicycles, but they are – you won’t believe it – slow. High speed trains usually don’t allow bicycles on board. But if the bicycle is packed in a so-called TranZBag, it is considered as normal luggage and can therefore be taken along. However, it turned out that my bicycle is too big for the bag. It was not sufficient to turn the handlebars and take off the front wheel as recommended. I had to take the back wheel off but the bike still wouldn’t fit in. I took the saddle off with the same result. Only after I had additionally demounted the handlebars completely, the bike was finally in the bag. The surprise was big, when I saw that the night-train to Avignon had a huge, empty bicycle compartment. At 5:30 AM I got off the train in Avingon, reassembled my bike, had a big breakfast and started cycling when the first daylight appeared in the sky. I hadn't researched about this confluence point beforehand, I simply found my way over tiny villages towards one coordinate plane on my map. At lunch time when had reached the town St-Ambroix, I thought that I had almost reached my goal. When I turned the GPS receiver on, I got a surprise: the distance to the confluence was still 33 km as the crows fly. Then I realized my mistake: I had been cycling to the wrong coordinate plane, i.e. to 44° 20’ N.
So I made my way south, crossing Alés, Lézan, St-Roman to the hamlet St-Nazaire des-Gardies. From that last village, I left the road network and cycled 300 m along a sandy track, following signposts to a campground. 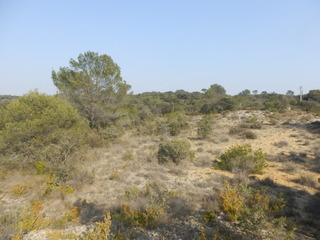 The confluence is just 13 m from the track in an open area with high grass and little pine trees. For this time of the year it was amazingly hot. Spring had already come in this region. I noticed that I visited 44°N 4°E on the 14th of March with an accuracy of 4 m.
I continued cycling towards the high mountain Mount Aigoual and stayed the night in the mountain village St-André-de-Valborgne. The story continues at 44°N 3°E.